In this study, tetradecanol–palmitic acid/expanded perlite composites containing carbon fiber (TD-PA/EP-CF CPCMs) were prepared by a vacuum impregnation method. 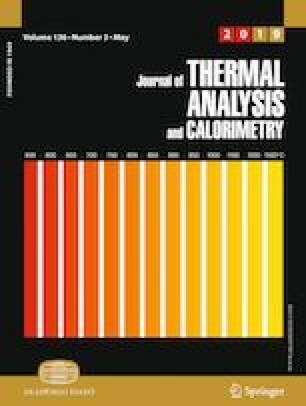 Binary eutectic mixtures of PA and TD were utilized as thermal energy storage material in the composites, where EP behaved as supporting material. X-ray diffraction demonstrated that crystal structures of PA, TD, EP, and CF remained unchanged, confirming no chemical interactions among raw materials besides physical combinations. The microstructures indicated that TD-PA was sufficiently absorbed into EP porous structure, forming no leakage even in molten state. Differential scanning calorimetry estimated the melting temperature of TD-PA/EP-CF CPCM to 33.6 °C, with high phase change latent heat (PCLH) of 138.3 kJ kg−1. Also, the freezing temperature was estimated at 29.7 °C, with PCLH of 137.5 kJ kg−1. The thermal cycling measurements showed that PCM composite had adequate stability even after 200 melting/freezing cycles. Moreover, the thermal conductivity enhanced from 0.48 to 1.081 W m−1 K−1 in the presence of CF. Overall, the proposed CPCMs look promising materials for future applications due to their appropriate phase change temperature, elevated PCLH, and better thermal stability. This work was financially supported by the Fundamental Research Funds for the Central Universities for financial support (Grant Nos. 2652017361), the National Key Laboratory Open Fund (Grant Nos. 10042015003) and the National Natural Science Foundations of China (Grant Nos. 51472222, 51872268).